Tadeo Torres is a large orphanage administered by Catholic nuns. We call it Tadeo, Casas or Cunas. It is at OSSO’s orphanage and here that you will serve the most. This orphanage is split into two sections: Casas and Cunas. Casas (houses) is for children 2 to 8 years old. When they reach about 8 years old, they are moved to another orphanage. 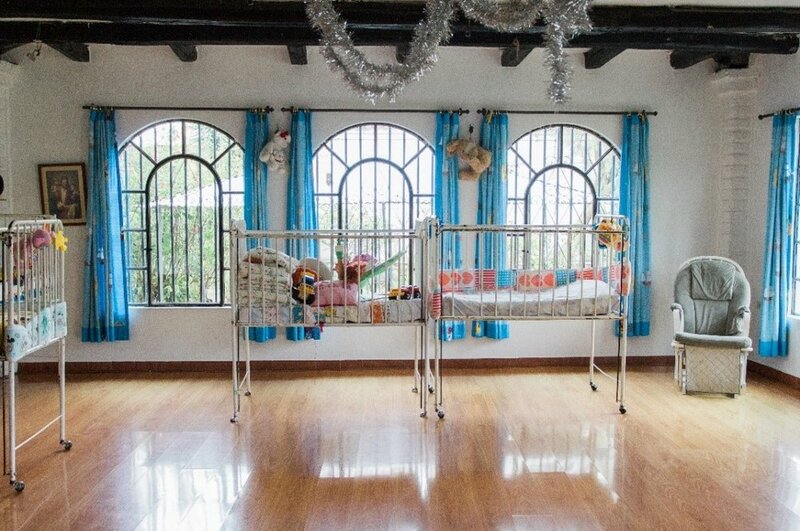 Cunas (cribs/nursery) is for children under about 2 1/2 years of age. Tadeo Torres is the only orphanage in Cuenca for babies. What your journal entry may read like after a shift here: Dear Diary, I just had an amazing (but really long) shift at Casas. Those children have SO much energy. I’m so glad that I know some Spanish like párate, siéntate, no más, compártalo, no pegue, solo uno & déjalo. I wish I knew more though. I love these kids. They are so willing to love you and they love to play with anyone and everyone. Today when I walked in, they all yelled my name. It really made me realize how long I’ve been here and how much I’m going to miss them when I leave in a few weeks. I wish I could just take every one of them home with me. I was assigned the activity for today so I brought popsicle sticks, hot glue guns, markers and lots of goodies like pompoms, googly eyes, feathers and tissue paper to decorate little funny characters and animals on the sticks. They turned out great but I had to make sure to keep the glue guns away from the kids. I’m so glad that there are so many craft supplies here at OSSO to choose from. I got my craft idea off of Pintrest. Having to come up with so many crafts and activities every single day is challenging but thank goodness we have internet. After the activity, we ate a snack and then went and watched a movie all together in the commons. Around 5:30pm we headed to their little rooms to wash their hands before dinner. I don’t know how the tias get these kids to all listen to them. They all have to line up and hold onto one another as they walk up to the commons again for dinner. We waited quietly until they finished as to not distract them and then we did my favorite part, we helped them get ready for bed. The tias already set out their PJs so I just tried to help them get ready and tucked them into bed. They begged for a bedtime story. Some of the other volunteers brought books to read to them but I just made up some story for them. They listened so intently, and even though I’m pretty sure my story was awful considering my broken Spanish, they begged for another one. It was almost 6:30pm though so I had to go. I hugged them and said a million goodnights and finally made it out the door. We waved goodnight to the nun at the door and all walked back next door to OSSO. Although shifts at Casas can seem sooo long, they’re always so satisfying at the end of the day. What your journal entry may read like after a shift here: Dear Diary, these have to be the cutest children on the planet. The Cunas’s kids are so precious. The hours kind of go by slowly as you play with the babies. I have to keep myself going and not look at my watch. The main play room has a bunch of toys. I love the bouncy toys and balls. The tias (the workers are called aunties) come in sometimes and sit with the babies or come and turn on the tv. The babies just stare at it and it’s hard to get their attention on other things. One of my favorite things is trying to get them to make animal sounds. They also love to climb into your lap when you grab a book and read it to them. A nun walked in today too and the babies totally perked up and were so excited to see her. It was so cute. We played for like 3 hours and then the tia came in and told us to walk them into the kitchen. She had prepared dinner for them. We grabbed a chair and sat in front of a baby and fed them a huge bowl of soup. The spoon I had was so big I didn’t think it would fit into this babe’s mouth! But it did and she ate all of the soup. When I was done, the tia gave me a cup of some sort of milk drink that was pink. After the adventure of trying to feed that big bowl of soup to a crying obstinate baby, I wasn’t super excited, but I did it. After all the babies were fed we took them into their changing room. The tia showed us who’s PJ’s were who’s and she left us to change the babies’ diapers and clothes. They wear so many layers of clothes. It’s a wonder how they don’t get hot during the night but I guess they don’t have heating. They have tights, a onesie, a PJ onesie and a big sweater on each kid. My favorite part of afternoon shifts at Cunas is probably putting them to bed like the Casa kids. You put them in bed, sing them a little song and put these cute little mosquito nets that hang from the ceiling around their beds. Afterwards we put the aprons that we have to put on in the beginning of shift away and put our shoes back on since we have to just be in socks all shift and then we headed back to OSSO. Older PostWhat Are the Orphanages Really Like?